Sorry to jump on the bandwagon here – and at a rather late stage – but I couldn’t not write about my Burger & Lobster visit. Everyone and their aunt has been tweeting pics of themselves eating lobster at this place, and I wanted to add my penny’s worth! If you’re a Londoner you will no doubt have heard of Burger & Lobster by now – it’s a restaurant that serves, (no prizes for guessing what’s to follow), burger and lobster. There’s a lively branch of this “chain” (though chain isn’t really a fair description, there are only four branches so far) in Soho, but I went with my friend to the Farringdon restaurant. Wait time for a table at 8.30pm on a Saturday was just over an hour an a half, so we popped to Smith’s at Smithfield for a couple of cocktails. I wouldn’t normally ever wait that long for a table, but as my friend promised, it was absolutely worth it! Cocktails: if you’re a margherita fan as I am then you will have to be physically removed from the Orange Sherbet version that they do. I could have kept on going with them all night, but I had to catch the last tube home and so my friend reigned me in. Thank goodness, because I did have a pounding headache the next morning…a double-alka-seltzer kind of headache. Summary, then: love it. 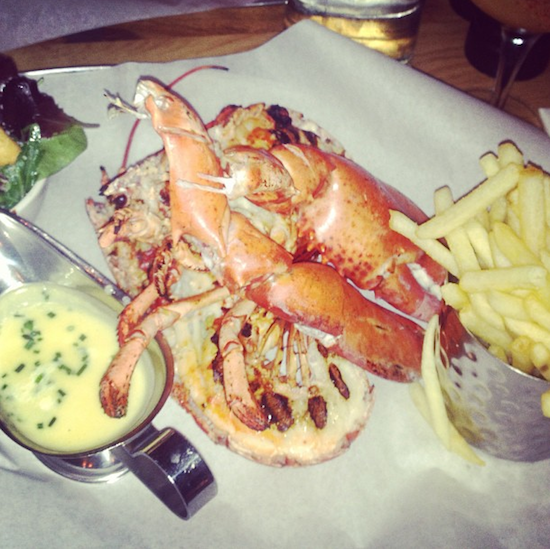 Didn’t try the burger, but why would you when you can get a whole, juicy lobster with sides for twenty quid? Brilliant place to go with friends – lively atmosphere, quick service, great cocktails. If you’re visiting London, or planning to, add it to your itinerary!